SCVHistory.com LW2359 | People | Baby Cher with Grandma Lynda Walker of Placerita Canyon, 1946-47. 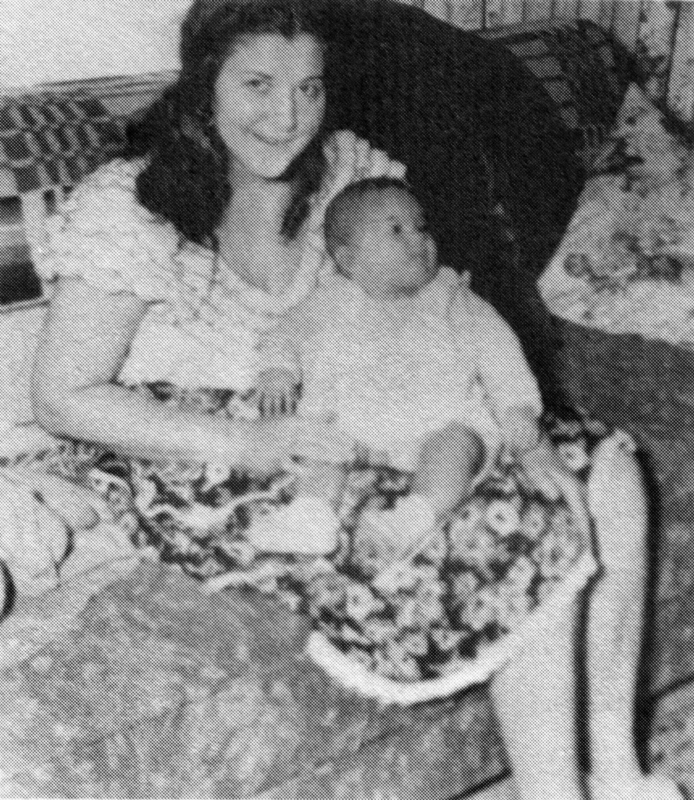 Baby Cher (Sarkisian/Bono) with her mother's mother, Lynda Walker of Placerita Canyon, in 1946 or 1947. Lynda Walker was married to Charles Walker, one of the 12 children of Placerita Canyon homesteader Frank Walker. Cher knew Charles as as "Grandpa Charlie" and Frank as "Papa Walker." In her autobiography, Cher writes about this photo: "My Grandma Lynda; she was only thirty-two in this picture. She's beautiful, isn't she, like a Gypsy. I'm on my way to a Porky Pig lookalike contest." If Cher is correct about her grandmother's age, and Cher's mother gave birth to Cher at age 18 or 19, then Cher's Gradma Lynda must have been very young when she gave birth to Cher's mother in Arkansas in 1927. Cher's Grandpa Charlie Walker had left home in Placerita Canyon at age 16  and obviously returned at a later date with wife and child. Cher's mention of her grandmother's "gypsy" persona in the caption to this photograph is a clear reference to Cher's hit 1971 single, "Gypsies, Tramps and Thieves." Written by Bob Stone, the story-song starts: "I was born in the wagon of a travelin' show / My mama used to dance for the money they'd throw / Papa would do whatever he could / Preach a little gospel / Sell a couple bottles of doctored brew..." Cher's mother, Jackie (stage name Georgia Holt, aka Georgia Pelham) was a model and struggling actress who, one supposes, would "dance for the money they'd throw," while her father, John Sarkisian, was a sometime truck driver who struggled with drugs and gambling. Kathy M. remembers (2017): "I worked at the Vons on Sand Canyon at Soledad for decades. Cher's grandmother Lynda Walker shopped there and was a sweet lady. Many times, she had a young Elijah Blue with her." Elijah Blue Allman, aka P. Exeter Blue, was born July 10, 1976, to Cher and second husband Gregg Allman. Cher was born Cheryl (Cherilyn) Sarkisian on May 20, 1946, in El Centro, but she grew up in the San Fernando Valley with her mother, Georgia Pelham (aka Georgia Holt, aka Jackie Jean Crouch), who was a waitress, model and part-time actress. Cher's father was an Armenian truck driver named John Sarkisian (alternately Sarkasian). Her parents divorced when Cher was a toddler; they would remarry and divorce two more times. Georgia/Jackie married a total of eight times, once to actor John Southall, whom Cher considered a father figure. "Grandma Lynda, my mother's mother, would sometimes get embarrassed by my Grandpa Charlie [Walker], who was a sweet man but absolutely unsophisticated. Grandpa Charlie had grown up with twelve brothers and sisters in a log cabin in Placerita Canyon, eighty miles or so outside of Los Angeles [it's more like 35 miles], where all the Westerns were filmed. He developed recipes for the Johnson Pie Company, and sometimes he'd bring his work home. 'If you can eat it all, it's all yours,' he once told me, setting down a chocolate cream pie. I ate the whole thing in one sitting and have never tasted anything like it since. "Grandpa Charlie's father, who I called Papa Walker [Frank Walker], still lived by himself in the cabin he'd built. He'd bought an expensive trailer, but he didn't like staying there, so he stored feed in it. Papa was a burly, red-cheeked outdoorsman who wore flannel shirts and one-piece long johns underneath. He'd feed the local deer, and when I came to visit I would watch them through the window of the cabin, just a few feet away. My grandmother told me that the cabin was Santa's house, and that these were his reindeer. "One day I went out to Grandpa Charlie's backyard and saw one of my reindeer hung on a hook off a tree. My grandfather had grown up hunting for venison, and he'd gotten a yen for some. I was just completely and utterly appalled. Grandma Lynda tried to explain it to me, but I wasn't going for any of that 'Now, Cher, all deer aren't Bambi' crap." LW2359: 9600 dpi jpeg from image printed in Cher's autobiography.